Many battery manufacturers are building energy intelligence into storage systems to unlock multiple revenue opportunities by allowing the customer-sited energy storage to participate in the local energy market. Solar paired with storage is increasingly becoming attractive due to the falling solar PV and battery prices with self-consumption becoming a significant driver toward decentralized energy. The growth of electric vehicles in critical global markets is also expected to spur the adoption of commercial battery storage because of its ability to stabilize the grid as well as generate an additional revenue stream. Partnership across the value chain is necessary to fully realize the potential of multiple revenue-stacking opportunities as the energy markets are rapidly changing with the evolution of numerous business models. 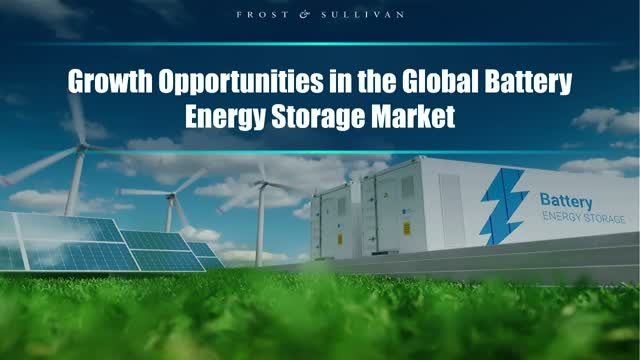 Frost & Sullivan invites you to join Jonathan Robinson, Program Lead, and Utham Ganesh, Energy Research Analyst, in the webinar: Growth Opportunities in the Global Battery Energy Storage Market. Hear why manufacturers must educate customers and promote the benefits of installing battery energy storage systems by improving the business case, such as aggregating surplus battery power, trading in balancing markets and improving smart home/building connectivity to unlock multiple revenue streams. • Gain insight into the trends in the residential, commercial and industrial battery storage segments. • Explore the main motivations behind installing battery storage in regions and potential concerns. • Identify the primary business models in battery energy storage and ways to reach the customer. Learn how innovation in refracturing and restimulation is creating opportunities for operators to increase well productivity without incurring the cost of drilling a new well. Digital transformation will enable operators, oilfield equipment and service providers to leverage technological advancement to improve well economics. • Learn about the growth opportunities for refracturing and restimulation in upstream oil and gas. • Discover the technical challenges and operator pain points. • Explore the innovations in refracturing and restimulation activities adopted by operators, oilfield equipment and service providers. Non-revenue water loss across the globe is estimated to account for about $39 billion annually and there is a renewed urgency to address leakage in pipelines. North America and Europe are driving the market growth with other regions following suit. Digital transformation in water utilities is resulting in the deployment of analytic platforms for event and asset management. Multiple solutions, including both invasive (Smart Ball) and non-invasive (acoustic) sensors for leak detection, are seamlessly integrated into a single platform for leakage management. Water utilities demand accuracy and immediate results to facilitate urgent redressal and reduce non-revenue water losses. Large corporations around the world are sourcing renewable energy for self-consumption. Companies are becoming part of prestigious groups to source renewable electricity. Frost & Sullivan invites you to join Shaik Safik, Senior Consulting Analyst, as he discusses the sourcing methods adopted by corporations across the world to procure renewable energy and how this trend is expected to grow in the future. · How has the corporate renewable purchase evolved over the years? · What are the drivers and barriers for renewable energy purchase at a global level? · Who are the major corporate renewable energy purchasers and their renewable energy targets? · What are the sourcing methods adopted and the risks involved? There are several cutting-edge companies already present in the market that have introduced their digital platform/architecture for transitioning to a digital grid. However, the industry currently does not have a clear market leader. The presence of unstructured data is creating a tremendous opportunity for the industry to take a market leader position for creating and innovating tools that will help utilities make the smooth transition to a fully digital grid through analytics. Frost & Sullivan invites you to join Farah Saeed, Research Director, Digital Grids, for the webinar: Growth Opportunities and Challenges for Optimizing the Electric Grid through Data Analytics. Learn what type of data analytic solutions are gaining the most traction along with market growth projections by region for smart grid analytics. Water requirements to satisfy fracking activity have skyrocketed in high-production basins, such as the Permian Basin, in recent years. The growth of absolute wells is putting pressure on water resources and the volumes of water used per frac are increasing. Aside from the increased cost of water and produced water treatment, the sourcing of frac water and transportation logistics place operators under stress to deliver stable and sustainable operations. These fundamental challenges are changing the way the industry engages with and manages water. An increase in the recycling of produced water and the growth of midstream partners, as well as their financial backers, are changing the industry landscape. • Discover how industry peers are changing their business models to drive sustainable operations. • Explore critical opportunities and pitfalls of managing a fundamental resource in a fast-growing industry. • Uncover the latest opportunities and challenges impacting future business growth. Modularity in data centers and related infrastructure solutions are gaining significant traction as a means to optimize cost and efficiency and keep pace with technology evolution in the IT field. On the other hand, the data center architecture is expected to become highly decentralized, where we will see a high volume of smaller edge data centers being deployed closer to the consumer. Frost & Sullivan invites you to join Gautham Gnanajothi, Global Research Director, and Vasanth Krishnan, Energy & Environment Analyst, as they provide insights on some of the most critical technology and trends in the data center sector and shed light on the impact these trends will have on future growth. • Investment/M&A: The current market ecosystem for edge data centers is diverse, with all classes of data center providers looking to pursue or already seeking edge as part of their strategy. • New Capabilities: As data processing takes place close to the source, it gives rise to new capabilities for those who manage or own edge computing resources. • Geographic Expansion: Data center operators/owners are expanding to tier-2 and tier-3 cities. The oil and gas industry has a reputation for being relatively tech-averse. However, innovations in technology and business models, and applied innovation from other industries, are impacting the use of technology in various stages of oil and gas exploration and production. The industry is taking new steps in innovations to create significant improvements in operational efficiency, non-productive time and cost of completion. Many states across the US have taken a proactive approach to address climate change despite federal pushback against clean power. California recently joined the growing list of states and regions that are committing to carbon neutrality and becoming 100% green with the recent passing of SB100. Reaching these goals is an ambitious task on many fronts. Regardless, there is a growing positive sentiment and a sense of urgency to embrace electrification of transportation (EoT) coming from the consumer and electric grid sides. Canadian utilities struggle with fiscal constraints, high customer service expectations, and disparate and aging networks, just like many other utilities globally. At the same time, they have built a reputation for the progressive adoption of advanced technologies and solutions, including smart water data-based solutions. This puts Canadian water and wastewater utilities in a pivotal position to share knowledge and best practices for tackling local problems that deliver global lessons. The SWAN North American Alliance's 5th webinar, hosted by Frost & Sullivan, will explore how data-driven, smart water solutions play a critical role in shrinking a multi-billion dollar deficit in North America’s wastewater and CSO (combined sewer overflow) management needs. Smart water solutions minimize and optimize compliance investment, reducing wastewater utility spend to operate the network today and into the future. Join this webinar hosted to hear SWAN North American Alliance experts and peers discuss insights into how utilities and municipalities can address critical investment needs, lower projected spending, and deploy advanced technologies. Over the past decade, the oil and gas industry has seen major volatility with the price of oil as high as $130 per barrel to as low as $30 per barrel. Today we are seeing an outburst of start-ups and a changing culture that is founded on innovation. The industry is currently witnessing the “Golden Age” of emerging technology developments and is poised to benefit from innovation designed to help the upstream oil and gas industry reduce costs and improve recovery rates. While some oil & gas companies are developing unique innovations themselves, the industry is benefiting from a surge in start-up companies focused on digital transformation and radical change proving that the oil and gas start-up ecosystem is alive and growing. The global energy transition is underway and is being led by renewable energy. Massive capital investment is being made in transforming the global power infrastructure; over $200 billion was invested globally in wind and solar in 2017. The fundamentals of the market are being challenged, creating growth opportunities for new players to disrupt the market and forcing existing players to innovate or gradually cede market position. · Gain insight into the key global growth hotspots within the power sector. · Understand the latest dynamics of the market and the main disruptors. Regulatory guidelines and budgetary constraints have long shaped grid investments. The primary focus is to ensure that the electric grid is available at all times and is resilient to any disruption. This has been a relatively predictable task until now. As more households gain access to and embrace disruptive devices such as smart home devices, electric vehicles, and distributed energy resources, to what degree are utilities prepared to manage these changes and what sort of role and influence will they have in the future? · Get an in-depth view of emerging and cutting-edge solutions that are transforming the digital grid space. · Learn about grid modernization initiatives. · Obtain insight on key stakeholders to determine who would be ideal strategic partners. Join this webinar hosted by Frost & Sullivan and hear from Smart Water Networks North American Alliance experts discuss the cyber security landscape in the water utility industry and best-practice solutions to ensure a secure future. Frost & Sullivan's Energy & Environment webcasts focus on smart buildings, the rise of renewables, the shale gas boom, and other key industry issues. Further, our in-depth coverage of global Mega Trends and emerging markets prepares Energy & Environment market participants to confront a zero-carbon economy, the growing economic importance of BRIC (as well as the Next Eleven) countries, and growing international interest in energy independence.